homemade "picassocam" pinhole camera, paper negative, 15-second exposure, scanned and post-processed in Photoshop, including coloring the image, and adding a texture from Kim Klassen's texture collections. Emma and Neil Erickson both came from Sweden in the 1860s-70s (separately) before marrying and homesteading a ranch in the Chiricahua Mountains in southeastern Arizona. Their home began as an existing cabin on the property that Emma had purchased on her own. Thick walls were later built by Neil, to act as protection against Apache raids, which commonly occurred in this area at the time. 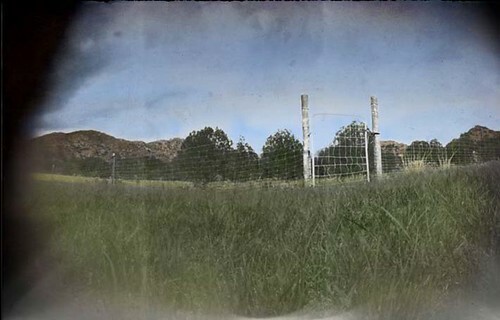 This fence marks the end of the cool grass of the ranch home, and the beginning of the high desert grassland and conifers beyond. Emma and Neil's two daughters expanded the house to it's current configuration when they made it a guest ranch in their young adult years. We had a wonderful tour of the Erickson Home: at the well-named Faraway Ranch- this summertime weekend. Kristy, you're doing such interesting things with your images. I'll definitely be returning for another look!